Fundraising and funding development through grants, donations of products and services in-kind and volunteers is critical to our success. 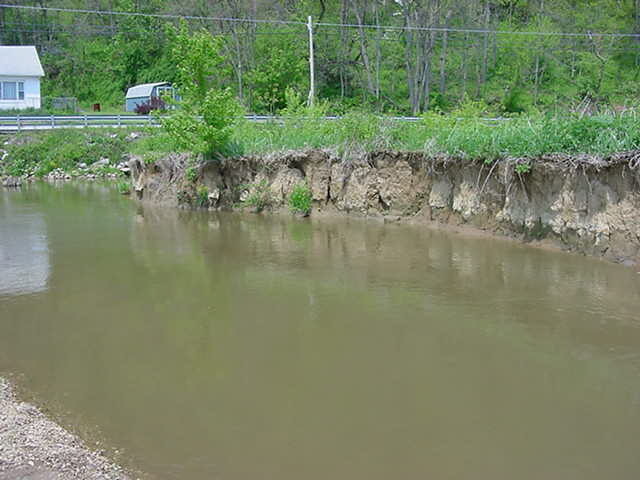 Severe stream bank erosion a high priority restoration. The CCWA is a membership based, Pennsylvania nonprofit organization. Operating costs are funded by membership fees and donor giving. Programs and project expenses are funded through public and private grants, as well as fundraising and local financial and technical donations (in-kind match). Nonpoint Source Pollution & Chesapeake Bay Educational Mini-grantsThe Pennsylvania Association of Conservation Districts Inc. (PACD) is now accepting applications for the 2003-2004 Nonpoint Source Pollution and Chesapeake Bay Educational Mini-grants. The grants provide up to $1,000 in financial support, it supports grassroots projects that help to improve local water quality and the overall health of Pennsylvania's watersheds. Projects must be completed by May 15, 2004. <> Additional information and grant application forms can be found on the PACD Web site, www.pacd.org. The Susquehanna River Basin Commission (SRBC) this week announced the availability of funding and training for local nonprofit organizations, municipalities and county conservation districts to conduct streamside cleanup projects. The funding, which can be used toward new or existing cleanup projects, is the most recent initiative by SRBC and PPL Corp. to expand its program to remove litter along waterways in the Susquehanna basin. The enhanced program is now called the Susquehanna River Basin Streamside Cleanup Training Academy and Assistance Program. Joining SRBC and PPL Corp. in the partnership effort are PA CleanWays, DEP and the Bon-Ton Stores Inc. The enhanced program is funded largely by a grant from DEP's Growing Greener Program and through a donation by PPL Corp. The Bon-Ton Stores Inc. also provided a mini-grant. Organizations interested in receiving up to $2,000 in funding toward their new or existing streamside cleanup project should submit their requests to SRBC no later than June 2, 2003. Eligible organizations include municipalities, county conservation districts, watershed organizations and other local non-profit groups located in the Pennsylvania portion of the Susquehanna River Basin. Projects selected to receive funding will be announced by SRBC early this September. Then, those organizations will have from mid-September 2003 through November 2004 to conduct their streamside cleanup projects. <> Request forms are available from SRBC and PA CleanWays in hardcopy and from their Web sites. SRBC: 717-238-0423, www.srbc.net; PA CleanWays, 724-836-4121, www.pacleanways.org. American Rivers-NOAA Community-Based Restoration Program Partnership Now Accepting Proposals for River Restoration Grants. American Rivers is seeking proposals for community-based river restoration grants as part of its partnership with the National Oceanic and Atmospheric Administration (NOAA) Community-Based Restoration Program. These grants are designed to provide support for local communities that are utilizing dam removal or fish passage to restore and protect the ecological integrity of their rivers and improve freshwater habitats important to migratory (anadromous) fish. Grants will be limited to projects in the Northeast, Mid-Atlantic, and California. Eligible groups will demonstrate how their project: (1) will successfully restore anadromous fish habitat, access to existing anadromous fish habitat, or natural riverine functions; (2) is the correct approach, based on ecological, social, economic, and engineering considerations; (3) will minimize any identifiable short- or long-term negative impacts to the river system as a result of the project; (4) has had community involvement in project decision making and may have community involvement in the implementation; and (5) will have the potential for public outreach and education. Successful applicants will be given non-renewable grants to assist in the technical application of fish passage or dam removal. Applications are currently being accepted for the second cycle of fiscal year 2003 with a deadline of April 1, 2003. Applications for projects need to be postmarked by the deadline for consideration for the funding cycle. In fiscal year 2004, applications will be considered in two cycles with the first deadline falling on November 1, 2003. We encourage potential applicants to contact American Rivers to discuss potential projects prior to submitting an application. For complete application and eligibility guidelines, please go to the American Rivers web site www.amrivers.org/feature/restorationgrants.htm or contact us at the address below. For more information on the NOAA Community-Based Restoration Program and its partners, please visit www.nmfs.noaa.gov/habitat/restoration/community/index.html. Contact: Peter Raabe, River Restoration Finance Associate, American Rivers, 1025 Vermont Avenue, NW, Suite 720, Washington, DC 20005. Email: rivergrants@amrivers.org. Grant writers needed! Volunteer today.